Play Ball! MLB's Opening Day Is Here: Changes In Safety And Diplomacy Are On Deck New technology, new safety measures, and a new relationship with Cuba are what reporter Jesse Sanchez says will be the big stories in baseball this year. Alcides Escobar #2 of the Kansas City Royals scores a run in the fifth inning against the New York Mets in Game Two of the 2015 World Series. Baseball's opening day is upon us. 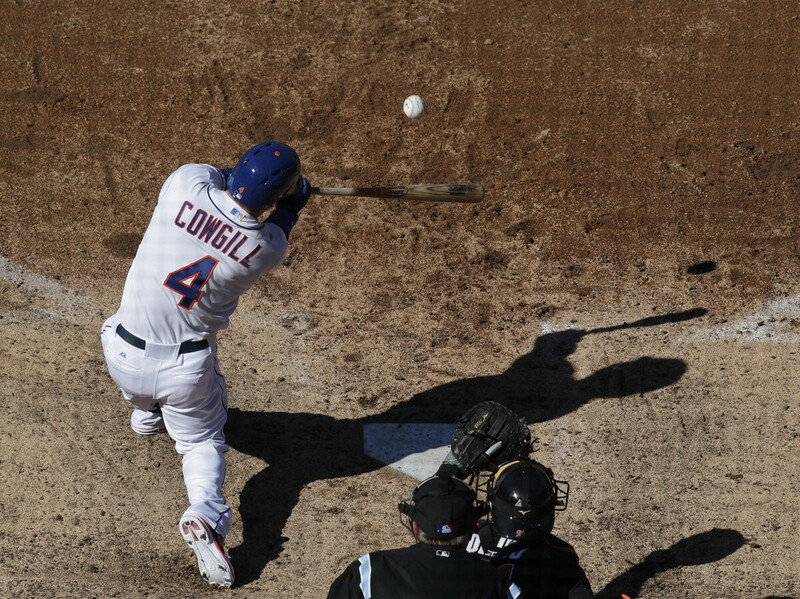 Sunday is the first official day of Major League Baseball's 2016 season. Starting things off will be two afternoon games as the Cardinals face the Pirates and the Blue Jays take on the Rays. The day will be capped off by a night match between the 2015 World Series contenders the Kansas City Royals and New York Mets. "Opening day is always a special time in baseball," says Jesse Sanchez, a national reporter for MLB.com. "It's always a special time for family, fans — you know, everybody gets together, watches these games," he tells NPR's Mary Louise Kelly. You may not notice, but a few things are going to be different when baseball returns this year. Something you may see for the first time — if your seats are good enough — is the presence of iPads in team dugouts. Traditionally, computers and smartphones have been banned — managers have sifted through statistics and other data on paper, gathered in folders. But a new agreement between Apple and MLB will give coaches iPads loaded with special software designed for baseball. "It's going to be neat to see these managers put away their folders and start scrolling, start swiping. 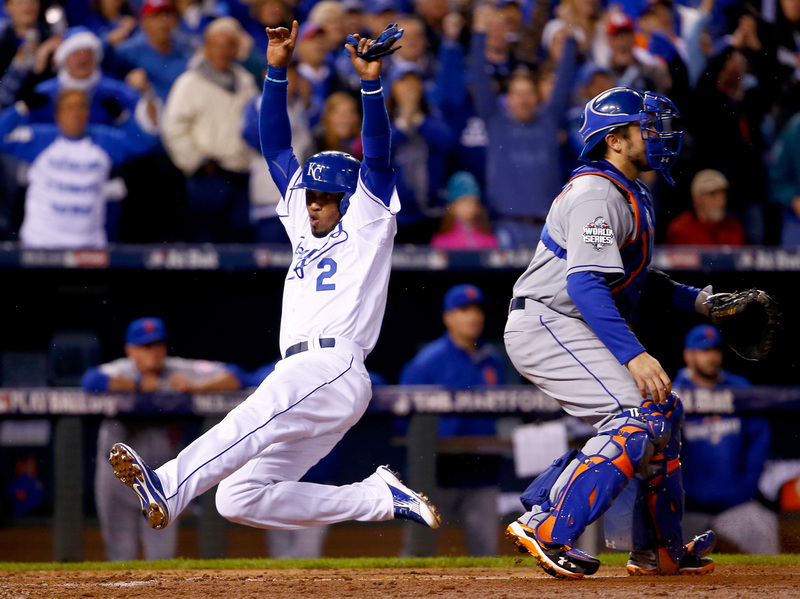 And watch coaches swipe when players are at bat or when there's a new pitcher to be put on the mound," he says. Another change: safety nets. Last year, MLB recommended the expansion of nets to 70 feet on both sides of home plate, which would help stop foul balls and loose bats from hitting fans seated on the field level. In 2014, Bloomberg News counted about 1,750 spectators injured each year by batted balls during games. As each stadium is unique, the recommendations are not designed to be a "one-size-fits-all." Recommendations also call for stadiums to do more to educate fans about the dangers of flying balls and bats. However, they are not binding rules and are up to the individual stadiums to implement. A photo taken through a safety net shows New York Mets' Collin Cowgill hitting a home run against the Miami Marlins at Citi Field, April 6, 2013 in New York. "I've heard some people mention watching a game through a net might not be as comfortable," Sanchez says. But he doesn't think it's going to be much of an issue. He points out that nets don't seem to have affected the fan experience of those sitting behind home plate — "the best seats in the house" — where nets are in place already. "As someone who's been around baseball for almost 20 years and as a parent who takes kids to the game — I think it's a good thing," he says. "You really don't want to see anybody get hurt. You don't want to see a parent, a kid, anybody get hurt [by] a baseball that flies into the stands or a bat that flies into the stands. So I'm for this measure." The beauty of a team like the Cubs is they have fans all over the world. It's hard to go anywhere and not run into somebody wearing a Chicago Cubs cap, T-shirt. And they're really excited. So that's a team I'm really paying close attention to and I think the eyes of baseball are really watching. San Francisco Giants: San Francisco is always a team to watch. They added a pitcher named Johnny Cueto, they added a pitcher named Jeff Samardzija. Traditionally they've been one of the [teams] to watch — they've won several World Series over the past few years. Arizona Diamondbacks: I think this year people are going to be paying close attention to the Arizona Diamondbacks — they signed a pitcher named Zack Greinke, who's arguably one of the top pitchers ever, he's one of the best pitchers in baseball. So people are paying close attention here locally to the Arizona Diamondbacks — I think nationally also. Sanchez also throws in the Los Angeles Dodgers, New York Yankees and Boston Red Sox as teams to keep an eye on this year. He notes the Red Sox have added "top pitcher" David Price. And there's going to be another reason to be watching the Red Sox this year: David Ortiz is going to be playing his final season. The designated hitter turned 40 last year — old for a baseball player. "So he's going to take one of these retirement tours," Sanchez says. "And I think it's going to be really interesting to see how each team reacts as he makes his final visit to Yankee Stadium, as he makes his final visit to Texas, as he makes his final visit to Anaheim. 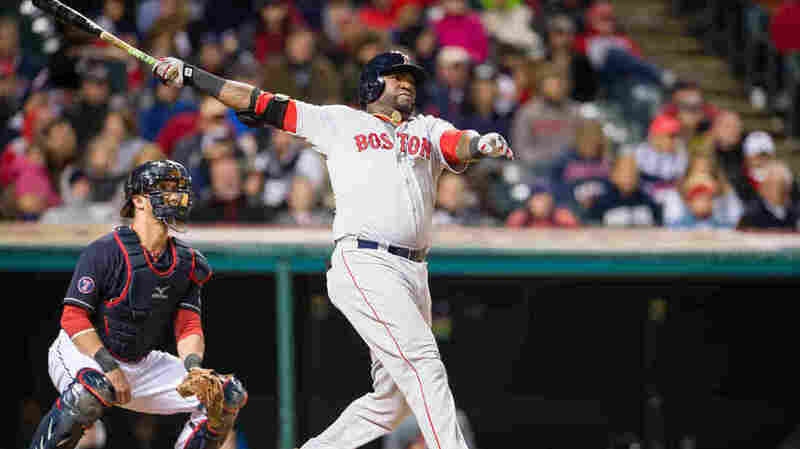 David Ortiz of the Boston Red Sox hits a two run home run during the fourth inning against the Cleveland Indians at Progressive Field on October 2, 2015 in Cleveland, Ohio. "And he's been a spectacular player his entire career," he says. Ortiz is "a dynamic player. He's also a larger-than-life personality." "Big Papi," as he's known, isn't shy about telling people how he feels. "He doesn't mind expressing himself, he has big opinions," Sanchez says. "He's an international star in Latin America and the United States. He's obviously bilingual so he reaches a large audience. He was part of that team that broke the Curse of the Bambino. So that is part of David Ortiz's legacy and I think people are going to pay attention to his final year in Boston." Ortiz was born in the Dominican Republic, the country outside of the U.S. with the highest number of players in MLB. Coming in second last year was Venezuela, with Cuba in third place. But that could soon change. Due to the frosty relations between Washington and Havana for the last half-century, the common way for Cubans to play baseball in the U.S. has been to defect. Sometimes they just walk away when they're part of a team competing outside of Cuba. But more commonly they escape the island with the help of human traffickers, who frequently demand a percentage of a player's contract money. 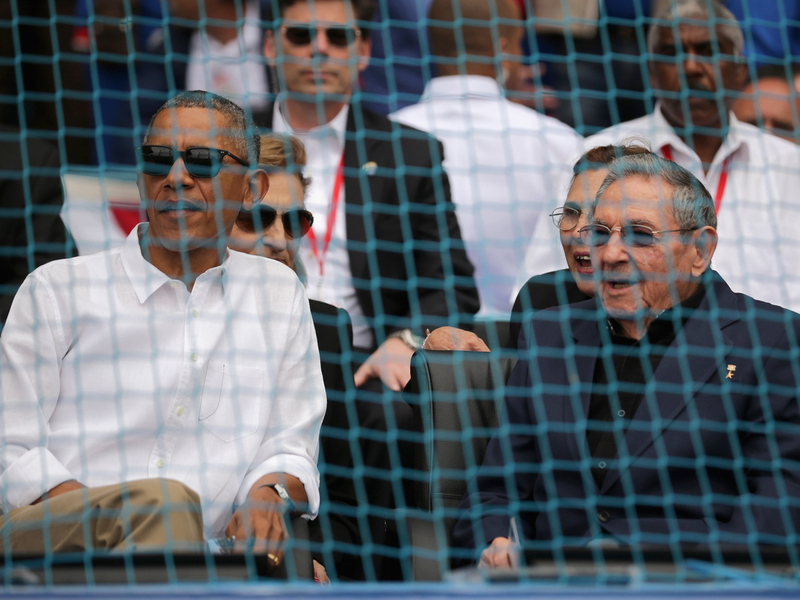 U.S. President Barack Obama and Cuban President Raul Castro attended a game between the Cuban national team and the Tampa Bay Devil Rays at the Estado Latinoamericano March 22, 2016 in Havana, Cuba. So while much was made of the geopolitical consequences of President Obama's historic visit to Cuba — the first by a U.S. president in 88 years — there is change afoot for baseball as well. "Everybody, I think, wants to get to a system where players can go back and forth without this overlay of human trafficking," said MLB Commissioner Rob Manfred. He spoke at a news conference in Havana, the day before the Tampa Bay Rays played the Cuban national team in an exhibition game during Obama's visit to the island last month — the first time a U.S. team has played in Cuba since 1999. "I also think there is common ground that the system should operate in a way that allows the very best players in the world to come and play Major League Baseball," Manfred said. Major League Baseball is "looking for ways to sign players directly from Cuba," Sanchez says. He says their goal is to create "a system where players can leave Cuba in a safe way and come back to Cuba, so they don't have to abandon their family and their lives. Obviously there's a lot of political hurdles before something like that can happen, but I think that's the ultimate goal." But he says it's hard to tell if easing restrictions on Cubans playing U.S. baseball will lead to a faster exodus of Cuban players. 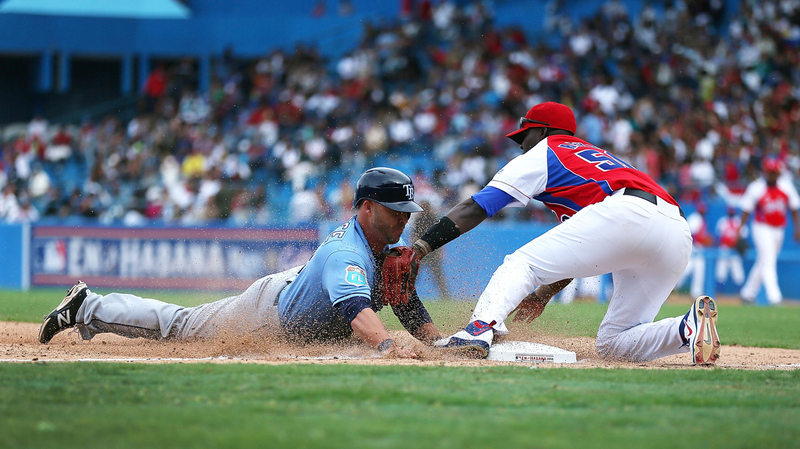 Cuban baseball authorities say the U.S. embargo needs to be lifted for any final deal on the matter. So in 2016, look for more attention to safety — and to Cuban players. "This is a good time to be a baseball fan," Sanchez says. "You really feel optimistic. Obviously, the season hasn't started and this is when everybody feels like they have a chance. Everybody is in first place. So it's a good time for baseball." Tampa Bay Rays' Steve Pearce dives safely into third base during an exhibition game between the Cuban national team and the Tampa Bay Rays at the Estado Latinoamericano March 22, 2016 in Havana, Cuba.